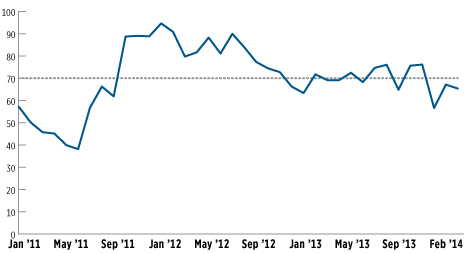 European holdings by U.S. prime money market funds have fluctuated significantly since early 2011. Prime money market funds greatly reduced their holdings of European issuers as a percentage of their overall portfolio in the summer of 2011, as the eurozone debt crisis worsened, and holdings have not fully returned to levels seen before then. This reduction in part reflects the perception that some European banks may be riskier now, but it also reflects the mounting regulatory pressures on European banks to reduce their reliance on short-term wholesale funding. In our latest release of N-MFP data, Table 3 categorizes prime money market fund holdings by country of issuer, based on the ultimate parent company of the issuer. For example, if a prime money market fund enters into a repurchase agreement (backed by U.S. Treasuries) with the U.S. subsidiary of a German bank, that holding would be counted as part of the Germany category in Table 3. These data can be used to track European holdings of prime money market funds since early 2011. Since then, prime money market funds’ holdings of European issuers have fallen from a peak share of 51.5 percent, reaching a low of 28.6 percent in June 2012 and gradually increasing thereafter. This trend continued in the most recent month, with the share of European holdings in prime money market funds’ portfolios rising slightly, from 38.17 percent in January 2014 to 38.42 percent in February 2014. 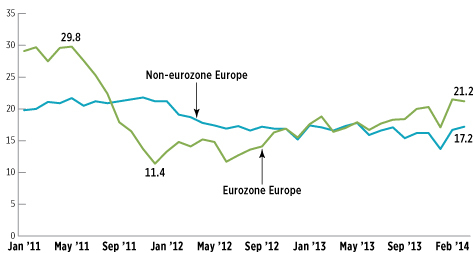 This share of European holdings remains significantly below the peak share seen in early 2011. Though much of the decline in the share of European holdings in prime money market fund portfolios is due to a reduction in holdings of eurozone issuers, prime funds have also reduced their holdings of issuers in Europe outside the eurozone. The figure below plots the share that prime money market funds allocated to issuers from countries that use the euro and from European countries that don’t. The share allocated to eurozone issuers fell from a peak of 29.8 percent in May 2011 to 21.2 percent in February 2014. By comparison, the share of prime money market fund portfolios allocated to non-eurozone European issuers fell from its peak of 21.8 percent in November 2011 to 17.2 percent in February 2014. Though much of the decline in prime funds’ European holdings is probably due to a decline in demand by prime money market funds, some is likely due to a reduced willingness to borrow on the part of European banks, because they now view short-term wholesale dollar funding as less attractive (money market funds cannot lend long-term due to maturity restrictions on their portfolio holdings). In addition, the eurozone debt crisis led prime money market funds to reduce the maturity of lending to eurozone issuers, especially French issuers. The figure below shows the percentage of prime money market fund holdings of French issuers that mature in 30 days or less (drawn from Table 9 in N-MFP data release). The maturity of these French holdings shortened significantly over the summer of 2011 (i.e., a greater share matured in less than 30 days). This share has averaged a bit more than 70 percent over the whole period. It may well be cheaper for banks to fund themselves short-term, but global bank regulators have made it clear that they do not want banks to rely too heavily on short-term wholesale borrowing. Indeed, the new Basel 3 regulations seek to explicitly limit how much banks fund their operations through short-term borrowing. These regulatory trends may affect prime money market funds’ holdings of European issuers going forward; indeed, they probably already have. For more on money market funds, please visit ICI’s Money Market Fund Resource Center. For more on Form N-MFP data, please visit the Taxable Money Market Fund Portfolio Data page. Chris Plantier is an ICI Senior Economist. When President Obama announced a new effort to expand access to retirement savings opportunities, ICI was among the first to applaud. The Administration’s “myRA” looks to provide a new option for Americans who want to put money aside for retirement, but who might not have access to a retirement plan through their workplace. These accounts would complement the wide array of investment options already available to these workers.